In 1802, sugar was first made in the islands on the island of Lānaʻi by a native of China. He came here in one of the vessels trading for sandalwood, and brought a stone mill and boilers, and after grinding off one small crop and making it into sugar, went back the next year with his fixtures, to China. The first commercially-viable sugar plantation, Ladd and Co., was started at Kōloa on Kaua‘i. On July 29, 1835 (187 years ago, today,) Ladd & Company obtained a 50-year lease on nearly 1,000-acres of land and established a plantation and mill site in Kōloa. It was to change the face of Kaua‘i (and Hawai‘i) forever, launching an entire economy, lifestyle and practice of monocropping that lasted for over a century. A tribute to this venture is found at the Kōloa Sugar Memorial in Old Kōloa Town. Sugar gradually replaced sandalwood and whaling in the mid-19th century and became the principal industry in the islands until it was surpassed by the visitor industry in 1960. Early sugar planters shared many challenges: trade barriers, shortages of water and labor, and the lack of markets for their sugar. Hawaiians were hired to work on the plantation. This had far-reaching effect on the social and economic make-up of the local society. This introduced the concept of independence for the Hawaiians. Workers were paid directly and no longer had to pay a tax to the chiefs. Workers were initially paid with coins. Getting enough coins to pay the workers was difficult in the 1830s. In response, Kōloa Plantation initiated the use of scrip as payment to workers; these were redeemable for purchases at the plantation’s store. However, due to counterfeiting, in 1839, scrip was printed from engraved plates, with intricate waved and networked lines. This more formal Kōloa Plantation scrip became the first paper money in Hawaiʻi. Not only was this scrip accepted at the Ladd & Company store, it became widely accepted by other merchants on the island. Sugar was the dominant economic force in Hawaiʻi for over a century, other plantations soon followed Kōloa. By 1883, more than 50 plantations were producing sugar on five islands. Kōloa Plantation set other standards that endured throughout the islands for over 100-years. In addition to the plantation-owned general store, housing was provided for workers. Barrack-type buildings or individual homes had space for workers to plant a garden. The company dairy sold milk to plantation workers. Medical services were provided. Hawai‘i’s economy turned toward sugar in the decades between 1860 and 1880; these twenty years were pivotal in building the plantation system. A century after Captain James Cook’s arrival in Hawaiʻi, sugar plantations started to dominate the landscape. What encouraged the development of plantations in Hawaiʻi? For one, the discovery of gold and rush of settlement of California opened lucrative avenues of trade in the Pacific. Likewise, the Civil War virtually shut down Louisiana sugar production during the 1860s, enabling Hawai‘i to compete in a California market that paid elevated prices for sugar. In addition, the Treaty of Reciprocity – 1875 between the United States and the Kingdom of Hawai‘i eliminated the major trade barrier to Hawai‘i’s closest and major market. Through the treaty, the US obtained Pearl Harbor and Hawai‘i’s sugar planters received duty-free entry into U.S. markets for their sugar. A majority of the plantations closed in the 1990s. As sugar declined, tourism took its place – and far surpassed it. Like many other societies, Hawaii underwent a profound transformation from an agrarian to a service economy. 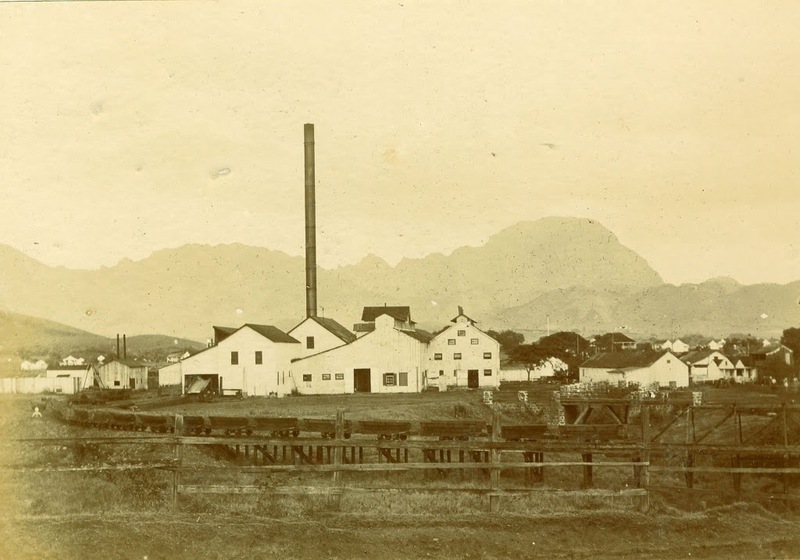 The image is Kōloa Sugar Mill in the 1880s; in addition, I have included some other old Sugar Mills related images in a folder of like name in the Photos section on my Facebook page. The Sugar theme, Mill and other Kaua‘i South Shore sites are included as Points of Interest in the Holo Holo Kōloa Scenic Byway. We are assisting Mālama Kōloa in the preparation of its Corridor Management Plan. Recently, the project was awarded a Historic Preservation Commendation from Historic Hawai‘i Foundation.